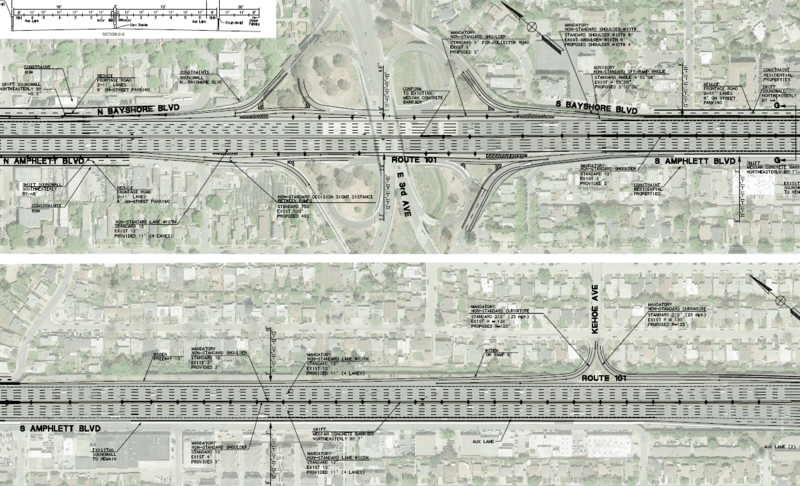 San Mateo County’s City/County Association of Governments (C/CAG) is leaving an expansion of Highway 101 with new carpool lanes on the table, even after the Metropolitan Transportation Commission (MTC) concluded they will jam up with traffic the day they open. If constructed–by 2024 at the earliest–a 14-mile section of the highway from San Bruno to Redwood City would be widened from eight to ten lanes at a cost of up to $250 million. MTC says traffic will move faster in all lanes, and carry more people in fewer vehicles, if the existing left-most lanes are converted to Express Lanes instead. Free for buses and carpools, and available to solo drivers for a toll, express lanes have cut traffic on Highways 680, 880, 580, and 237 by maintaining a congestion-free lane even during rush hours. On Highway 101 such lanes could help pay for express bus and van services. The express lane conversion could be completed in three years and cost $110 million less than the carpool lane expansion favored by C/CAG. “It would be a huge missed opportunity if we can’t use innovative strategies to cut traffic by moving more people in fewer vehicles along the Bay Area’s most critical transportation corridor,” said TransForm Community Planner Clarrissa Cabansagan. TransForm published a study in 2013 [PDF] making the case for converting existing lanes to express lanes on Highway 101 rather than widening it. Express lane revenues could fund transit improvements, including Caltrain capacity upgrades and express SamTrans bus services that have been cut in recent years. Revenues could also subsidize other vehicle trip reduction programs including discounted or free transit passes or credits to use car-sharing and bike-sharing services. That conclusion ignores the effects of induced demand and potential transit improvements. C/CAG’s forecasts exclude many potential transit upgrades and Transportation Demand Management (TDM) programs that could be funded by the $110 million in construction cost savings and express lane toll revenues. C/CAG plans to begin the environmental review of various options for dealing with the highway’s chronic traffic jams within the next few months. The agency hasn’t yet announced whether express lanes will be considered nor which transit improvements the toll revenues would fund if built. Of course, the MTC wants to convert/take the left lanes from pretty much all Bay Area freeways, as it turns into revenue. MTC needs revenue to justify its continued role, and to spread its ideology. The problem is they spend public money on a bazillion dollar new headquarters in SF, waste public money on the Bay Bridge construction fiasco, and now want to do the hostile takeover of ABAG. It’s a huge power trip manifested in the persona of Steve Heminger. What “ideology” are we talking about here? The belief that motorists should pay for the roads that the state builds for them? That market economics applies to traffic demand as well as areas? Good grief. Always amazes me when otherwise “free market” people think there’s absolutely no problem with socializing all the costs that highways and roads bring to our communities. Roads are subsidized. Ports are subsidized. Railroads are subsidized. As is mass-transit. Our roads are required for our economy to function, regardless of the desire of the anti-car movement. Exactly. MTC wants to capture every dollar of regional transportation funding and blow it all on wasteful and/or corrupt contracts. Converting existing lanes to toll lanes just furthers that agenda. NO! In fact, commute times are now slower then they were before the widening. Is it anti-car to think maybe we should use a different approach given that widening the highways to provide congestion relief hasn’t had the desired effect over the last 30 years? All those things are subsidized from a government P&L statement, but that does not include so many things that are externalized. A mass transit trip has to be subsidized by the governments dollars on one hand, but on the other hand that trip saves the government money in ways that aren’t measured on the P&L. If there was no MUNI, how much money would the SFMTA have to spend trying to get people around in cars? How much less would SF take in in property taxes because there would be more parking garages and less retail/office/residential? We are going to have to do a several billion dollar reconstruct of CA-37 because it’s sinking into the sea. Why is it sinking into the sea? Once again with we have to subsidize the most expensive form of transportation because of the poors. 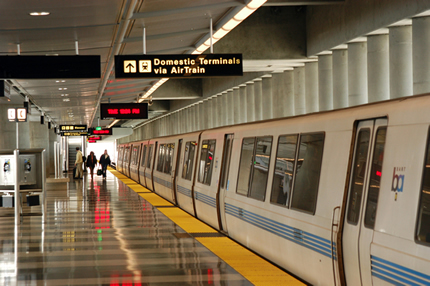 Where’s the protest of the Caltrain and MUNI fare increases? There is no stronger argument against this expansion than the proven fact that it will not work. All the other reasons are secondary. If it means having the majority of motorists pay their fair share for road infrastructure, then yes, cutting some people who can’t afford it a break is a reasonable trade-off. Transit is unfortunately not a workable option for every person and every trip. That’s more likely to be true for you if you’ve been priced farther and farther out of the Bay Area and are commuting long distances to work. If the express lane proposal costs $110 million less than the expansion plan, that means it still costs $140 million. How and why does it cost $110 million to convert an existing traffic lane to express lanes? Isn’t it a horrible symbol of the wealth inequality in our area to have more and more highways where you have to pay to not be stuck in traffic? Perhaps Google, Facebook, Apple, et al… could contribute to the cost of the expansion, since carpool lanes through this stretch would be a significant benefit to their shuttle bus commuters? I have to commute once a week from Healdsburg to Santa Clara. I take transit. The least likely place for a person being priced farther out of the Bay Area to be commuting a long distance to work is … US-101 in San Mateo County. Nothing on that corridor is cheap. Under the express lane plan, rich people will be able to pay to buy their way out of congestion, and the revenue generated will go towards projects that benefit everyone. So that’s a transfer of wealth from the rich to the general population. Additionally, the express lanes will benefit public transit users, who are overwhelmingly lower income. Under the expansion plan, everyone will remain stuck in traffic, regardless of income level. And what reason do we have to trust that the resulting revenue (after however many years it takes to pay off the $110 million in costs plus ongoing operating expenses) will actually go to transit projects that benefit everyone rather than towards the MTC’s megalomaniacal efforts to control everything in the region? The MTC’s proposal relies on a sort of trickle-down transit theory: take away a general purpose traffic lane; thus making traffic worse so some people feel compelled to pay to use the lane that was “free” (subsidized yes, but free of additional charge) yesterday; use the revenue in unspecified ways that will allegedly help everyone else; and apply a great deal of magical thinking and hope that 10-15% of drivers will suddenly shift modes because they find the new conditions you create too intolerable. The likely result is that, once traffic becomes suddenly worse, drivers will form a pitchfork mob and drive every elected official in San Mateo out of office before anybody tries a new bus route. I’m not opposed to priority for transit, which absolutely makes sense. But it’s wrong to insist that the right solution here is to intentionally worsen traffic so people will be forced to switch to nonexistent future transit options that we’ll see if people like someday. There are also some really weird perverse incentives here. If the revenue goes toward SamTrans express service down the Peninsula, funding for transit will be directly linked to the amount of traffic congestion in the general purpose lanes. 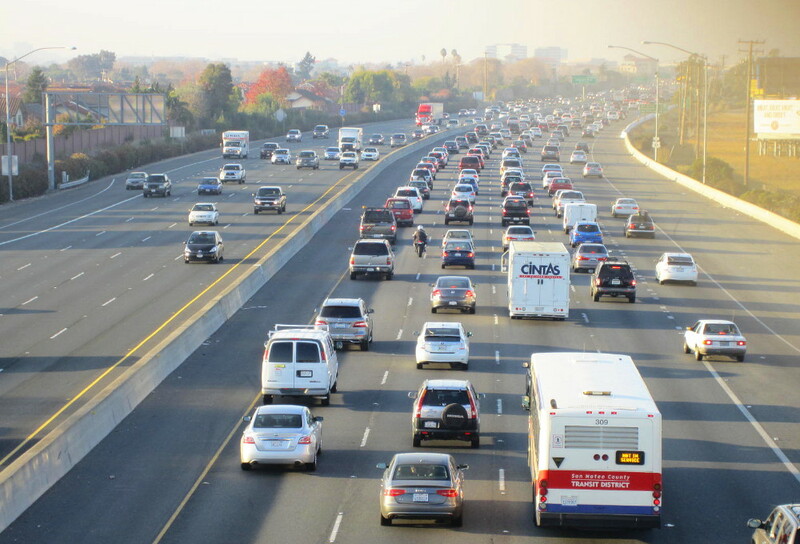 If traffic falls, whether due to the success of TDM and transit initiatives or due to economic conditions, the express lanes become less attractive, revenue drops, and SamTrans gets to cut its express bus service yet again. In any case, the real need here is to figure out how to get more capacity on Caltrain and to execute on that project as quickly as possible. I’m going to guess that is 120 miles. What is the average journey time by public transit? I’m going to guess that would not be an acceptable commute to most people. Roads do not just benefit motorists. They benefit everyone due to their role in the conveyance of goods. Toll roads do benefit those who pay them to travel more quickly. But they also benefit the rest of us by taking traffic off the “free” roads and lanes. Admittedly that works best when the toll road is a totally segregated highway rather than just a special lane. But the principle is the same. First class seats on planes do not harm people who fly coach. Indeed they help enable coach seats be cheaper than otherwise. Envy is not an argument to not have tolls on roads. I’d prefer to see them on regular highways than on bridges and tunnels where, inevitably, they cause backups and delays. But the MTC’s plan here is to remove a general purpose lane and convert it to an express lane. By definition, that harms the people not in the express lane. MTC’s belief is that the resulting harm will be great enough that 10-15% of solo drivers will start carpooling or get on a future bus service for which there is no current plan. “By definition that harms people not in the toll lane” – Citation, please. I don’t see how this harms people not in the toll lane. They are still paying the same amount as before, nothing. Reducing capacity on a highway doesn’t necessarily increase travel times just as adding capacity doesn’t necessarily reduce travel times. It isn’t a linear relationship. Do you regard adding the fourth bore of the Caldecott tunnel as oversubsidizing roads for motorists? Honestly, that only applies to the first two lanes. The citation is the MTC’s own presentation, linked in the article. Their “stage 3” (HOV 3+ and express lanes) states “GP congestion worse than existing levels.” Only after applying the magical thinking of “transit and TDM” would their plan claim any improvements. I do have concerns about those fare increases and many concerns about our funding structure for roads, but I’m not sure that’s super relevant to this. You have nothing substantive to say about whether or not it makes sense to convert existing lanes to carpool lanes, so you rant away with a attack on the MTC that has nothing to do with the question. Stop thinking about who you hate, and start thinking about whether it is a good idea to convert existing lanes to carpool lanes, in order to reduce congestion and reduce greenhouse gas emissions. Talking about power trips, how many tons of carbon dioxide does your car emit each year? It is absolutely the case that we need to deliberately make traffic worse in order to build transit, bike, and pedestrian projects. Every time you remove a traffic lane for a bus lane (as is currently happening on Geary and Van Ness) or a bike lane (as recently happened on Folsom and on 8th St) or pedestrian space, this is what you are doing. And that’s how it should be, because those modes are more efficient at moving people than private vehicles. There’s no “magical thinking” behind the idea that solo drivers will switch modes to carpool or transit once congestion worsens; it’s been proven time and time again that congestion (time cost of driving) and tolls (financial cost of driving) are the main drivers of transit ridership. So from an incentive point of view, it is good that solo drivers who use the lanes are tolled even if your evidence free hand-waving conspiracy theory is true and the money is never spent on transit projects. I don’t even consider it a commute – more like a business trip. It takes 3.5 hours each way – the first 45 minutes are a bike ride to Santa Rosa, if I drove to the bus station in SR it would be more like 3. This relies on being on a bus in Santa Rosa at 5 AM, peak commute in Sonoma/Marin starts at ~5:30 AM. Obviously that’s not a commute we should be optimizing, and Healdsburg isn’t exactly where people with lower incomes are fleeing to – we are a net importer of people in the daytime because our workforce can’t afford to live here (in part due to people like me with South Bay salaries who telecommute). The two commute segments – SR->SF and SF->South Bay do show how we underprice road usage. The traffic in Marin is ridiculous. If we priced the trip properly there would be better ferry service, SMART would already be in place and outstrip what it will eventually do, and there would be more frequent express bus service. But driving is cheap so people put up with it. There are more people working low wage jobs in San Mateo than you think. SFO (including its tenants) is a huge employer, not to mention retail, hotel workers, etc… They all have to get to work somehow. This makes no sense. Traffic is taken off of the free lane, but there is one less free lane. The only way that argument might work is that the free lanes then become so intolerable that some people choose not to make the trip at all. Which is really what happens, there is a certain threshold of traffic people will tolerate, and that is the equilibrium congested roads tend to in the limit. First class seats use up more of the cabin space per capita, and remove legroom from the economy seats. And since airplane space is finite, and airlines are subsidized (via airports), the existence of first class doesn’t really accrue a discount to economy class. My uncle works as a mechanic for United at SFO. He lives in Tracy. He and a couple of his friends purchased a cheap van to carpool with rather than driving on their own every day. We should be incentivizing these kind of impromptu vanpools rather than continuing to support people driving on their own. One way we can do that would be to charge for people traveling in the Express Lanes. There is little financial incentive for people to do these kinds of things if we create HOV lanes and then not charge for them. It’s funny how you believe every column in MTC’s graph, except for the last one. If you don’t hold any stock in their data, why are the first three okay but not the last one? Interesting that you’re willing to believe the first three columns, but not the last one. If you think MTC’s projections are suspect, why believe the first three without the last one? MTC Express/Lexus Lanes overall are not helpful and could be viewed as a theft of existing public free lanes to become toll lanes. If MTC has their way, all Bay Area freeways would be Toll Lanes. Aside from that, MTC is dysfunctional. They leapfrog over all aspects of public approval or vetting. Oh, and my 5 bicycles, 2 motorcycles, one car and one truck generate .69 tons of CO2 annually. I try and use all of them as appropriate. WTF do you care? A rotting, felled tree outputs carbon as well, along with methane. Also, even ignoring SFO employees, service-sector jobs along the peninsula are generally clustered along fairly dense corridors served by various rail and bus options. Is it all perfect? No. (Though then again neither is driving). Is every trip ever on the Peninsula possible by transit? Nope. But, wow, $250 mil + for yet more pavement which will induce yet more demand and worsen all the other externalities associated with overreliance on car trips would be quite a pointless and unsustainable boondoggle.